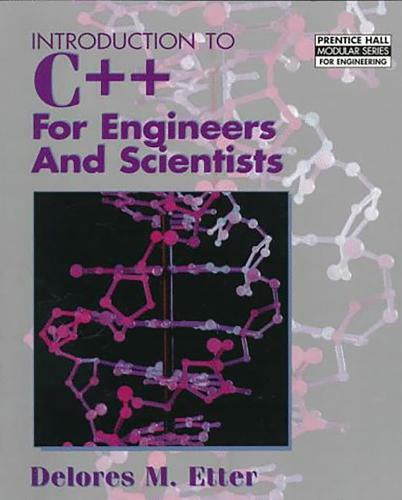 From best-selling engineering computing author Delores Etter, this book presents a consistent methodology for solving engineering problems through an introduction to the fundamental capabilities of C++, the language of choice for many practising engineers and scientists. It introduces the basics of C++ programming, and allows instructors to cover additional materials in the same class in the same semester, and allows instructors to reasonably require students to buy additional books and materials for the course. It emphasizes real-world engineering and scientific examples and problems, centered around a theme of Engineering Grand Challenges. These include: prediction of weather, climate, and global change; computerized speech understanding; mapping of the human genome; improvements in vehicle performance; and enhanced oil and gas recovery. It also introduces software engineering concepts, focusing on the design and implementation of user-friendly and reusable computer solutions; and readability and documentation in the development of all programs.